I received an email from a new client Heidi: "I have a wet bar in our dining/living room that we want to repurpose and make into something else." She wondered if a small coat closet and a computer desk might be incorporated to turn it into a more functional space. Another alternative would have been to replace "the wet bar with a bar area against the wall, and ideally still include a small computer space." But she did not want it to be "boxy and odd." Heidi wrote: "We have not set our hearts on anything in particular yet and would like to work with you to come up with a plan for this space. I have attached several photos and maybe a video if it goes through. Let me know what other info you need." Heidi found me just by searching for an architect online. Her and Greg used the services of an online home decorator before; Heidi explained: "Kind of the same idea as your business -- sets you on the right path to DIY -- and it worked out really well." Helping to repurpose something is an ideal project for DIY Ally. I was happy to guide them. My only objective was to steer them in the right direction. I told Heidi that the next step for her would be to draw a plan to scale of that area. I was going to make rough sketches on top of their drawings. Heidi was receptive. She said that it sounded like fun and asked me if there is a program that can help her do that. I encouraged her to draw by hand and sent her my how-to e-book DIY Like an Architect. That way, her and Greg could refer to the step on Scaled Drawings for clarification. Heidi and Greg did a terrific job with the drawings. One was "overhead," or a plan and the other was "as if standing in the dining room, looking at the wet bar" or an elevation. They documented the location of the plumbing pipes on the plan, in case they decide to go with a wet bar. They also showed recessed lights and vents in the ceiling on their elevation. In response, I sent back one idea. Aiming to repurpose the existing wet bar into a functional space, I incorporated a 2'x2' coat closet, a desk surface 2'x3'with a couple of shelves above, and a shelving unit at the end. 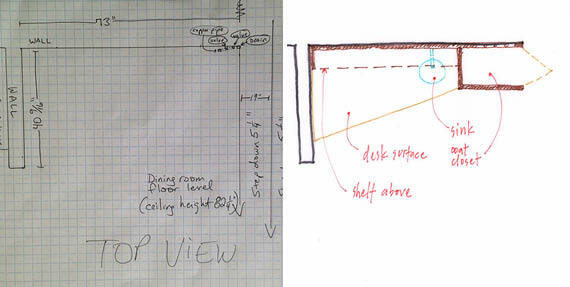 In my explanation, I wrote: "Notice that the shelving unit only goes as high as the top shelf above the desk. Over that, there is a deep cubby that opens on the side of the front of the unit. Hope this works for you. BTW, you can put a sink (a wet bar) there too. It will require some sort of a lid (could be a nice detail) for those times you need to use the space as a desk." They hired me for an hour. My mission was accomplished. The sketches emailed were supposed to be very diagrammatic, without any stylistic references. However, I couldn't help but wonder if they thought that my solution was "boxy" and "odd." I actually continued thinking about it. Thus, I decided to explore another possible approach below. 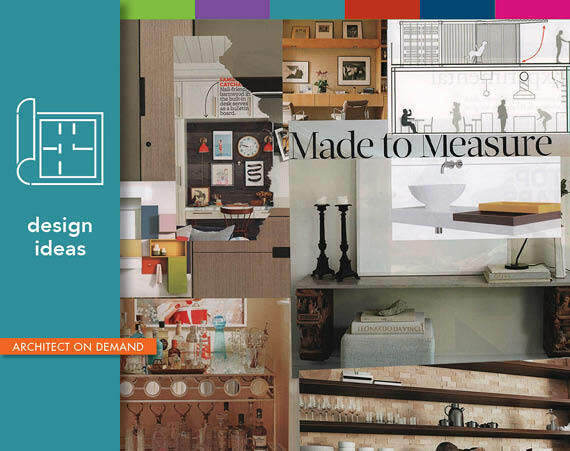 When it comes to creating a functional space, it's important to consider many options. 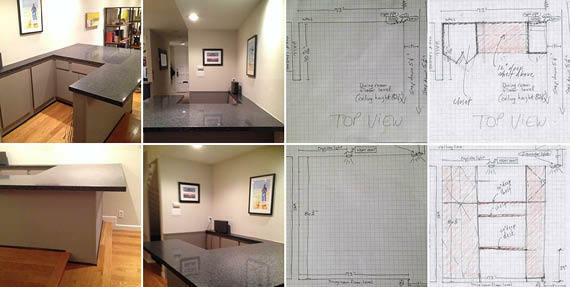 I am sure that Heidi and Greg will take into consideration that the desk height is different than a wet bar height. It's for them to decide if they like a built-in look or if they would prefer the unit to appear as a free-standing piece of furniture. They will choose materials, combining impervious surfaces of tile or stone with wood in their own creative way. That's why I mentioned to Heidi a special gadget on hinges that can transform a wet bar into a desk. I love to repurpose while engineering unexpected yet practical contraptions. But as DIY Ally my role is to suggest a direction, not to solve something. I trust that Heidi and Greg will take it much further. Here is a reference for them: DIY Furniture books by Christopher Stuart offer instructions and inspiration for furniture making.